Pigeons and doves are usually healthy birds, but they are subject to certain illnesses. Some are species-specific, while others affect birds in general. Watch your bird for any signs of unusual behavior and take him to an avian vet if he appears sick. Pigeons and doves might carry and suffer from common bacterial infections, including E. coli, salmonella and chlamydia. The latter two can be transmitted to people. In pigeons, salmonella infection can develop into paratyphoid, or salmonellosis. Symptoms of this fatal illness include swollen legs and joints and lumps full of fluid. Birds with E. coli infections develop loose droppings. Prompt treatment with antibiotics can cure the infection. Chlamydia causes upper respiratory infections and conjunctivitis in birds. It also responds to antibiotics if treated quickly. Pigeons are vulnerable to a pox spread by mosquitoes. This pigeon pox can take three different forms. The most common involves the skin, with pustules and scabs appearing on the face, feet and legs. 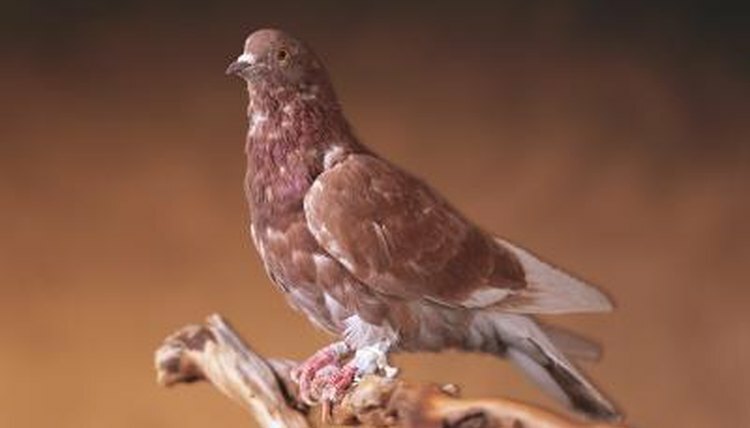 Pigeons usually recover from this form with treatment. The diptheritic type can result from the skin infection or appear on its own. Affected pigeons suffer from eye ailments such as conjunctivitis or eyelid infection, as well as lesions in the esophagus and upper respiratory tract. Birds often die from diptheritic pox. The third form is always fatal, with appetite loss and depression the initial signs before the bird succumbs. A vaccine is available from your avian vet. Pigeons coming down with the first two types of pox can be treated with antibiotics, ophthalmic ointments and daily skin cleansing. Coccidiosis, known in pigeon and dove circles as "going light," results from an infection by intestinal protozoa. In doves, the coccidia responsible are Eimeria labbeanna and Eimeria columbanum. The term "going light" refers to the diarrhea and weight loss affecting pigeons with coccidiosis. Other symptoms include a hunched appearance, frequent yawning and paralysis. Your vet can treat your bird with antiprotozoal medications. The protozoa Trichomonas gallinae causes trichomoniasis in pigeons, but most birds have the parasite in their bodies with no clinical sign of disease. Young doves and pigeons are the most susceptible to infection, which incurs a high mortality rate. Pigeons pick up the parasite through contact with an infected bird's bodily fluids. Since trichomoniasis results in oral lesions, also known as canker, it can be spread by sharing the same food and water. Symptoms include salivation, depression, diarrhea, trouble eating and drinking, open-mouth breathing, difficulty standing and a foul smell. Your vet can prescribe antiprotozoal medications, but often the affected bird must be force-fed.